Apologies for poor spacing. I cannot move the text up any further or reduce the headings any smaller with Word Press. Did you know that some cheese products may contain toxic chemicals called phthalates? Pronounced thal-eights, these are hormone-disrupting chemicals that may do the most harm in pregnant women and young children, and are linked to a genital condition in baby boys associated with increased risk of reproductive health problems and learning disabilities. Some phthalates are already banned in children’s products in the United States and in Europe – so why did they show up when cheese product items were tested? Kraft is America’s biggest brand of cheese by far. That’s why people all over the country are calling on this company to show leadership by getting toxic phthalates out of any of its cheese products. 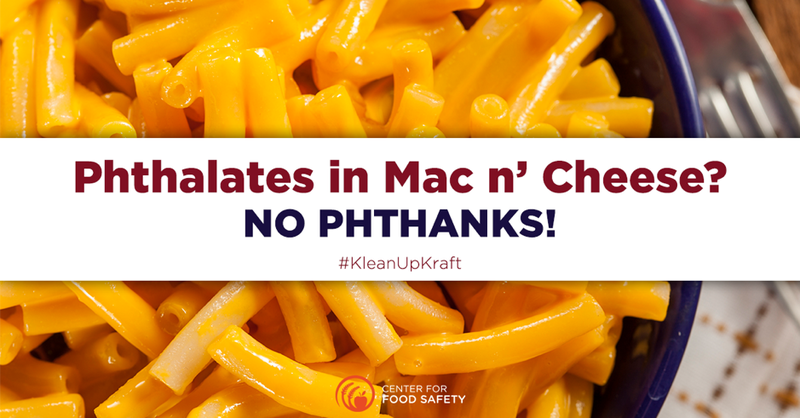 Recent laboratory testing found toxic chemicals in some Kraft cheeses. Laboratory testing of cheese product samples was completed early in 2017, and shows that eight of the nine individual Kraft cheese product items tested, including macaroni and cheese powder, contain phthalates (THAL-eights), a group of toxic chemicals that threaten the health of kids and pregnant women. Twenty-nine of thirty cheese products tested from the largest food brands contained these chemicals. Physicians and health scientists have raised serious concerns about the harm that elevated exposure to phthalates can do: studies in children have linked prenatal exposure to some phthalates with harm to the developing brain, leading to learning disabilities, attention deficit disorders, and behavior problems. Other studies found that boys exposed prenatally to certain phthalates were more likely to have a genital condition associated with increased risk of reproductive health problems. Consumers must demand that Kraft lead the industry in taking action. By eliminating any sources of these toxic chemicals, Kraft can help prevent avoidable exposure to toxic chemicals. Phthalates are so dangerous that some are banned from use in toys and other products. The United States has banned six phthalates in toys and other children’s products, and five more phthalates are proposed as additions to that list. Europe also prohibits or tightly regulates several phthalates in items that come into contact with dairy and other fat-containing foods. Clearly, phthalates don’t belong in any food. So why are phthalates in food? Phthalates are added to many of the materials that come into contact with our food, from plastic equipment used in the processing of food, to the packaging that food is sold in. Phthalates leach out from these materials into our food, ending up in our bodies. A powerful company like Kraft has a responsibility to its consumers to keep these hormone-disrupting chemicals out of its products.Consumers can’t tell from a label if food contains phthalates, so we have to rely on companies to take responsibility for keeping phthalates out of their manufacturing and packaging, and off our plates. Safer alternatives to phthalates are widely available to manufacturers, and many companies have already been proactive in making phthalate-free products. CFS welcomes your questions and comments. Please contact us at office@centerforfoodsafety.org, or at one of our offices. This entry was posted on Sunday, August 20th, 2017 at 1:39 pm	and is filed under Health Matters: Flashes & Reports, Home Page. You can follow any responses to this entry through the RSS 2.0 feed. You can skip to the end and leave a response. Pinging is currently not allowed.